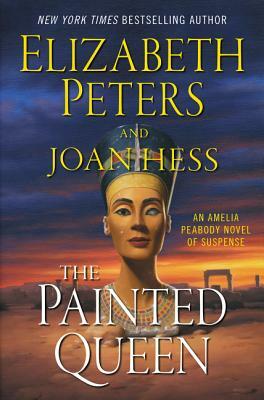 Painted Queen debuted at #7 on the New York Times bestseller list, and #5 on the Washington Post bestseller list. What a testament to the pent-up demand of many fans who had been waiting for this final chapter of the Amelia series! Chronologically, the final book was Tomb of the Golden Bird, published in 2006. Barbara said she wanted her beloved characters to go off into the sunset happily, and that she wanted to write the actual ending of the series while she was still at full strength in terms of her writing. She had commented admiringly on Agatha Christie’s similar decision to write the endings for her sleuths Miss Marple and Hercule Poirot long before the end of her writing career. But where Christie held the final books for publication until the very last, Barbara published her final Amelia and then went back to fill in “missing years” in the Peabody/Emerson chronicles. Queen is the last of these fill-in novels. Barbara was so invested in this final novel that she actually asked friend — and voice of the Peabody/Emerson clan — Barbara Rosenblat to perform a public reading of the then-unfinished book. Rosenblat read this early part of the novel at a ceremony in which the Maryland Library Association honored Mertz — attending in the author’s stead because she was too ill at the time to go. Rosenblat assumed that the book would never be finished. As it turned out, she was able to do one more Amelia reading after all! So, happy birthday — here’s to Barbara! — and to Joan and Salima and “Rosenblat” (affectionately) and to the whole community that continues to love and breathe life into the worlds that Peters and Michaels left us. Four years ago, we lost a friend and author whose voice echoed in that of Amelia but also of Emerson and Nefret and Ramses — of Vicky and John and Jacqueline and Abdullah. We hear her in the erudite narrator of Temples, Tombs and Hieroglyphs as well as in the silliest of the farcical moments in Naked Once More or The Camelot Caper. Sensible, wistful, glorying in the ridiculousness of life, horrified by human cruelty, impatient with snobbery — there were many voices in her writings. But no one who knew Barbara Mertz could doubt one key message she wanted to impart: we should celebrate the many gifts we have. Celebrate that we are here. Celebrate each other. Celebrate the amazing variety of cultures and art and music and gardens and … well, it all gets too much to put in a paragraph, let alone a sentence! Chocolate! Gin! Cats! Celebrate that there are dahabeeyahs! Barbara with her arms wide open in welcome and enthusiasm — we celebrate this memory. MONDAY NIGHT, July 31! New York City! Barbara Rosenblat Reading from Painted Queen! 7 pm, bookculture on Columbus!